LoveLula.com: LOTW - Sweet dreams are made of this! LOTW - Sweet dreams are made of this! Oh I just had to write to tell you all about a new addition to the LoveLula.com family of fabulous products! 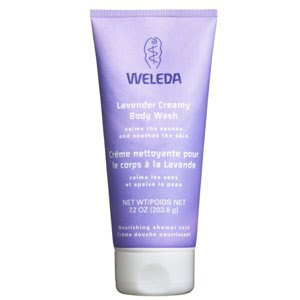 So let me introduce you to the newest member of the Weleda Family; the Lovely Lavender Creamy Body Wash.
We’re loving the pretty lilac coloured packaging and the easy to use tube but not as much as we love the stuff that’s inside! This heavenly, all natural wash cleanses your skin with the gentle aroma of precious, pure lavender oil. Soothing and aromatheraputic, it also has a calming effect on the central nervous system, which promotes healthy sleep and relaxation. Nothing makes us feel (or Look!) better than having had a good night’s sleep and the vegetable-based cleansers in this wonderful little wash will leave you feeling fresh, clean, gently hydrated and perfectly prepared for a night of restful slumber and sweet and happy dreams! At only £6.95 this one’s not going to break the bank either, so you certainly won’t be losing sleep over the price!